This Persistence Market Research report on the global oat flour market analyzes the opportunities in the market, and presents the updates and insights pertaining to the various segments of the global oat flour market over the forecast period 2018–2026. This report provides forecast and analysis of the global oat flour market. It provides historical data from 2013-2017, along with estimated data for 2018, and forecast data up to 2026 in terms of revenue (US$ Mn) and volume (MT). The report also includes macroeconomic indicators, along with an outlook on oat flour for the global market. It includes the drivers and restraints of the global oat flour market, and their impact on each region during the forecast period. The report also comprises the study of ongoing industry trends and opportunities for oat flour. It also includes value chain analysis. For providing users with a comprehensive view of the oat flour market, we have included detailed competitive analysis, along with key players in the market, and analysis on the strategies followed by them. The competitive dashboard provides a detailed comparison of oat flour manufacturers on the basis of revenue, product offerings, and key strategies. The study encompasses market attractiveness analysis by nature, end use, distribution channel, and region. A detailed study of oat flour has provided our analysts with the comprehensive view of the market, which shows the increased usage of oat flour in a variety of end-use industries such as bakeries, confectioneries, breakfast cereals, dairy products, etc., that include oat flour as an ingredient to increase the nutritional content of the overall product, and also increase its fibrous content. Data for organic oat flour has also been given. Organic oat flour production is also increasing due to the increasing demand from consumers. The report includes the company profiles of key manufacturers of oat flour in North America, Latin America, Eastern Europe, Western Europe, APAC, and MEA. A number of primary and secondary sources were consulted during the course of the study. Secondary sources include Factiva and Hoovers, and company annual reports and publications. 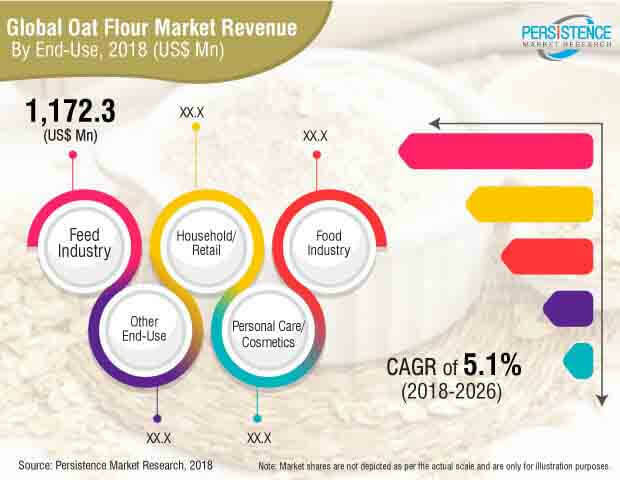 This report covers market dynamics related to oat flour, which include the drivers and trends driving each segment and opportunities in the oat flour market. The report also includes analysis and insights into the potential of the oat flour market in specific regions. Detailed profiles of providers are also included in the scope of the report to evaluate their long-term and short-term strategies, product portfolio of oat manufacturers, and recent developments in the oat flour market space. Some of the key players analysed are Grain Millers, Inc., Richardson International, Ltd., Hain Celestial Group, Inc., Bob’s Red Mill Natural Foods, Inc., Blue Lake Milling Pty Ltd., Swedish Oat Fiber AB, Bagrry's India, Ltd., Unigrain Pty Ltd., Anson Mills, Helsinki Mills Ltd., Morning Foods Ltd., Avena Foods Ltd., etc. Another key feature of this report is analysis of the global oat flour market and the corresponding revenue forecast in terms of absolute dollar opportunity. This is usually overlooked while forecasting the market. However, absolute dollar opportunity is critical in assessing the level of opportunity that a provider can look to achieve, as well as to identify potential resources from a sales perspective in the global oat flour market. To understand key segments in terms of their growth and performance in the global oat flour market, Transparency Market Research has also presented a market attractiveness index. The resulting index should help providers identify existing market opportunities in the global oat flour market. The report covers an in-depth analysis of all components of the value chain in the global oat flour market. In the final section of the report on the global oat flour market, a competitive landscape is included to provide a dashboard view of global oat flour manufacturers. The oat flour industry, globally, is expected to grow at a CAGR of 5% during the forecast years. Revenue obtained from the global oat flour market is projected to reach US$ 2,970.5 Mn by 2026. Oat flour is manufactured by grinding oats to form a fine powder. There are various end-use products of oat flour, such as bakery products, confectioneries, breakfast cereals, etc. Other flours are also being replaced in households with oat flour so as to find a healthy and more nutritional alternative to the food that is consumed. Oat flour is also mainly used as a feed additive for horses, pigs, chickens, and other pet animals. The benefits of oat flour on humans and animals is so extensive, that it is also used in the personal care cosmetics industry in moisturizers and creams because of its benefits. Research and development regarding oat flour is widely being carried out by companies that are manufacturing oat flour. This is due to the wide applications and health benefits of oat flour, and thus, companies are trying to create new products that could increase the sales of their products. Oat flour is high in dietary fiber and nutrition as compared to other processed oat products. This is because other products go through various heat treatments and unnecessary compounds being removed from those processed foods. This makes them more appealing, but the nutritional value goes down. This is the reason why many consumers include oat flour in their diets. It is also used as a supplement for muscle building, as it contains high protein and starch that are essential nutrients. Oat flour is known to have been used more lately, due to its ready-to-drink factor, which has become a necessity nowadays. Also, the addition of oat flour in products has become a new trend. Oat flour has been proved to be a good substitute for dairy, especially in making ice cream. This is due to the creamy texture of it when heated, and also in terms of nutrition, oat flour is high in carbohydrates, fats, and protein. These is the nutrition that is present in milk or milk products. The demand for oat flour thus increases, as the manufacture of such products increase. Oat flour is also used in dairy products to bring a creamier consistency to them. An increase in the addition of oat flour in dairy products such as yogurts, smoothies, milk, etc., has been observed lately. The incorporation of oat flour in dairy products is projected to have a CAGR of 6.3% in the forecasted period. Oat flour contains beta-glucans, sugars that are responsible for reducing the bad cholesterol in the body, and also lowering blood sugar. The health benefits of oat flour are also for people that are working on muscle-building. Healthy eating is a trend that is growing among people, which has resulted in many people opting for incorporating oat flour in their food products or eating it along with water or milk. It also keeps the stomach full, thus helping in maintaining weight. It can also be consumed by all age groups. Organic oat flour has been promoted among health conscious people, due to no-chemicals added during production. It has been priced higher by almost 40% than that of the conventional oat flour. Also, the organic oat flour segment is expected to grow at CAGR of 7.3% in terms of volume by 2026. A section of the report highlights the global demand for oat flour. It also provides the market outlook for 2018–2026, and sets the forecast within the context of the dates. This study discusses the key drivers and opportunities contributing to the growth of the global oat flour market, as well as analyses the degree at which the drivers are influencing the global market. In the final section of the global oat flour report, a competitive landscape has been included to provide report audiences with a dashboard view. Key categories of providers covered in the report are global oat flour key players. Detailed profiles of the providers are also included in the scope of the report to evaluate their long-term and short-term strategies, key product offerings, and recent developments in the global oat flour space. Market participants in the global oat flour market include Grain Millers, Inc., Richardson International, Ltd., Hain Celestial Group, Inc., Bob’s Red Mill Natural Foods, Inc., Blue Lake Milling Pty Ltd., Swedish Oat Fiber AB, Bagrry's India, Ltd., Unigrain Pty Ltd., Anson Mills, Helsinki Mills Ltd., Morning Foods Ltd., and Avena Foods Ltd., among the other oat flour manufacturers.